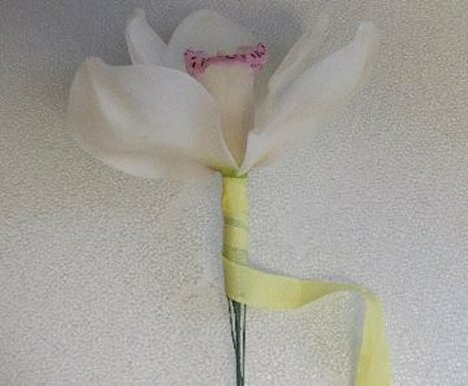 Wiring the white cymbidium orchids is the next step in this wedding bouquet tutorial. I started by choosing the bouquet holder, creating a larger collar out of two wire collars, soaked the bouquet holder in water treated with Crystal Clear flower food and then flowered in with Casa Blanca lilies. Cymbidium orchid blooms grow on a long, slender stem with many short laterals (tiny branches) coming off it. 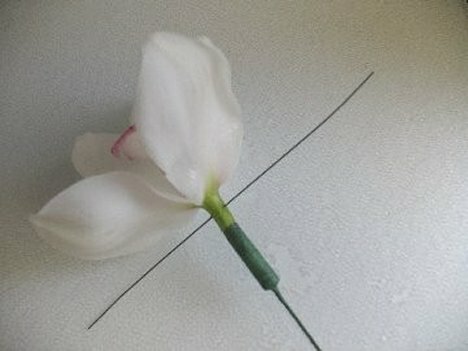 Therefore the stem must be lengthened before inserting into the bridal bouquet. I use flower picks, most frequently used in corsage work, to lengthen the stems while at the same time providing water to the flower head. 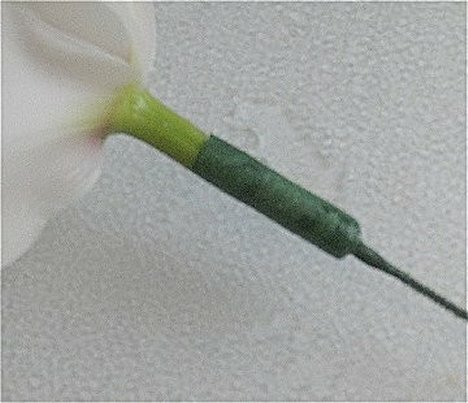 Flower picks are long, slender wires taped with green florist tape with a tightly rolled head of cotton batting on one end. You soak this batting in water before using on the orchid. While the pick is soaking, make a clean cut on the bottom of the cymbidium. Insert the water soaked pick into the bottom of the cut stem. The batting should fit snugly against the cut stem, allowing the flower to draw up water into the head. 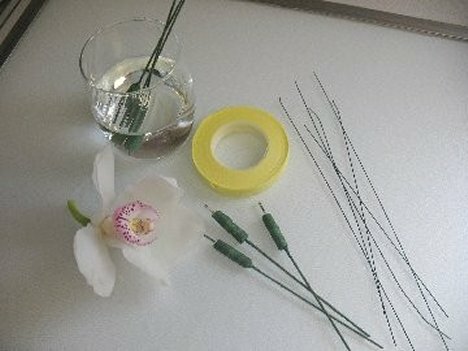 I insert a wire into the stem of the flower horizontally. Bend the wire down so it overlaps the flower pick. 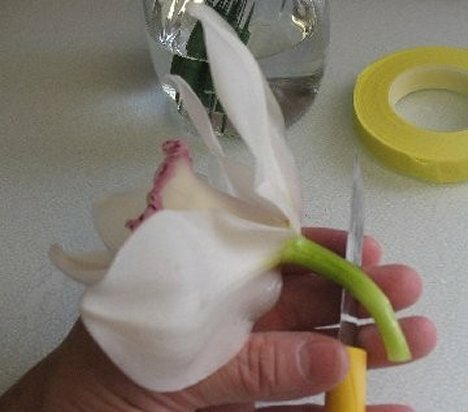 Using florist tape, wrap all the way from the top of the stem down. Most florist tapes are green, but I'm using yellow to compliment the other colors in the bouquet, since no greenery is being used in this design. Light green would have worked fine as well. 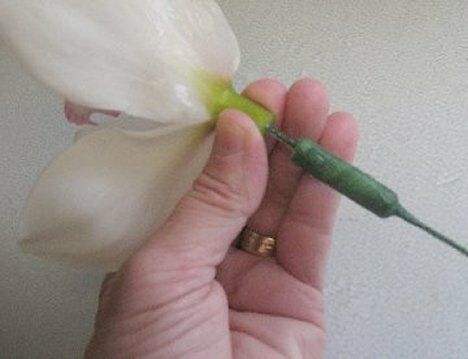 Now you have a nice, neatly wrapped wire stem that provides a water source to the flower head. 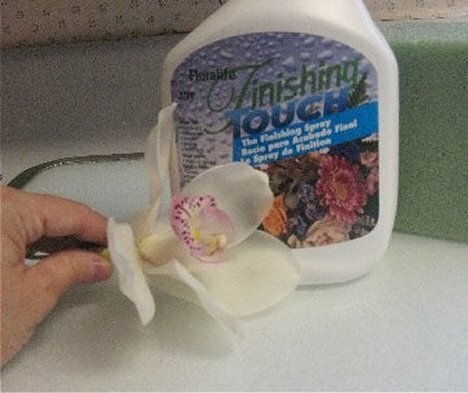 I always mist my orchids and roses with a shot of Finishing Touch before setting them aside for use in my bouquet later. Until needed, I generally stick my wired orchid in a block of foam. This allows the orchid to stand up straight and lowers the danger of creasing the petals before I use them. 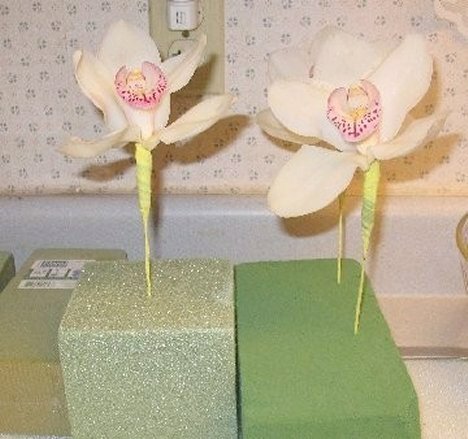 Wire all the white cymbidium orchids you before inserting into them into the bouquet.